Share your experiences with the ELITE RMGT Users Group. The SMART RPC further enhances work efficiency by printing in combination with the smart make-ready function which automatically performs blanket cleaning, plate changing, preset inking and test printing. Thanks to these systems, make-ready time before production printing is reduced approximately 30% (approx. 3 minutes) compared with the combination of the Full RPC and SMART make-ready function for the RMGT 9 SERIES. 1. Plate cylinders begin in a printing status position. 2. The phase of all plate cylinders is switched to the same position. 3. 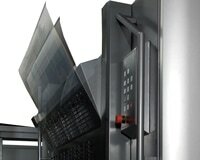 Used plates are simultaneously ejected, then new plates are simultaneously inserted on all printing units. 4. The phase of all plate cylinders is restored to printing status position.